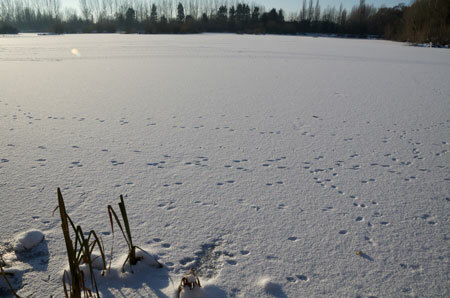 Thrupp Lake was mostly completely frozen over and looking alluringly pristine except for a smattering of bird and small animal tracks. 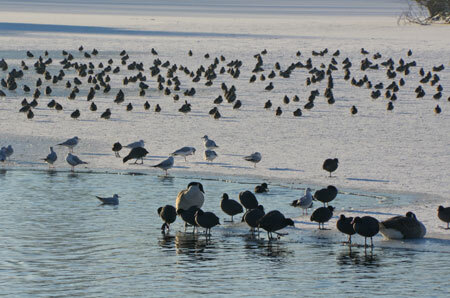 The birds were all still there, crowded around the far edge of a patch of unfrozen water adjacent to Sandles, but looking more animated and less unhappy than a few days earlier. 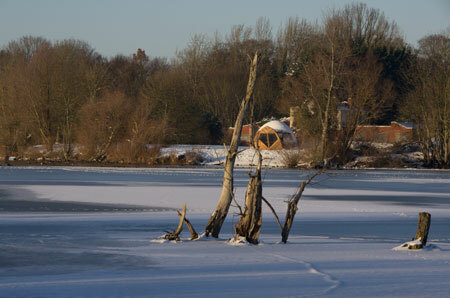 Thrupp Lake, mostly covered with ice and snow, as seen from the SE corner. Note the new shelter just right of centre. 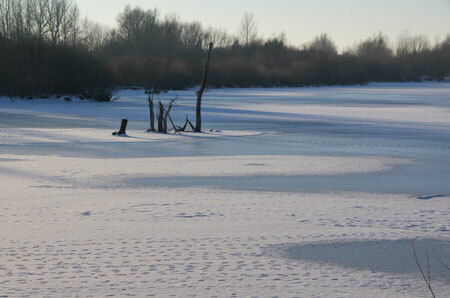 The lake, a sheet of snow and ice, quite pristine except for a few animal and bird footprints. The SE corner where patterns on the ice are indicative of varying thickness. 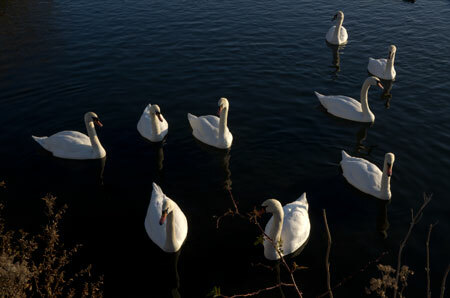 A group of mute swans in a patch of unfrozen water by the shelter. 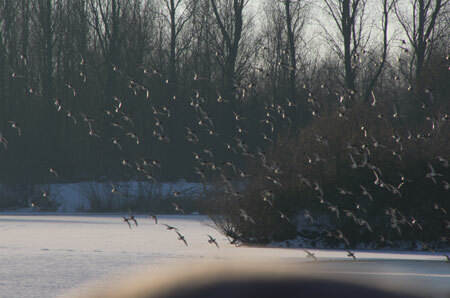 Part of a flock of several hundred tufted duck flying over the lake. 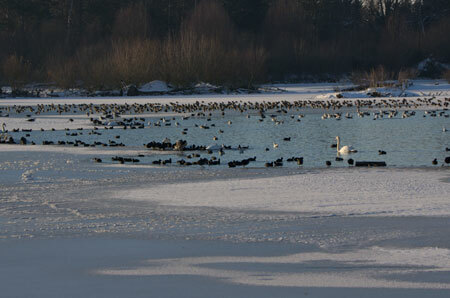 Just some of the many wildfowl packed into the small area of unfrozen water by Sandles. 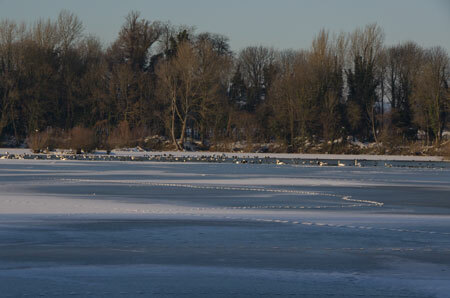 Wildfowl on Thrupp Lake: coot, ducks, gulls and geese all sharing the same patch of ice and water. Wildfowl on Thrupp Lake. The gulls present at about this time included some rarities, though not necessarily present in this photograph, such as Caspian and Yellow-Legged Gulls. Thrupp Lake, looking towards the northern shore. 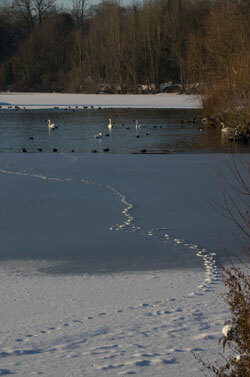 A prominent track winding across the ice from the SE corner to where all the birds were gathered. 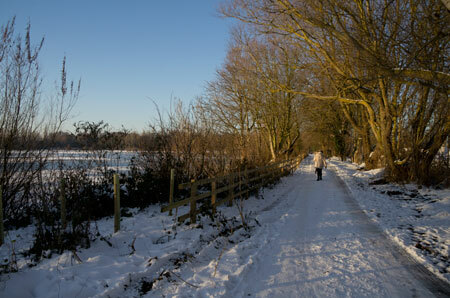 Making tracks for home: The byway alongside the lake.